I'm losing my mind. If you thought my desperate Jerked Mac and Cheese dinner was a lack of judgement then you better fasten your seatbelts for today's slice of hot mess that is my life. I, a grown woman, locked myself out of the house this morning leaving my healthy lunch trapped on the kitchen table taunting me from the window. (I'm nearly 30 but I'm still getting the hang of this whole "adulting" thing.) After a few sad attempts to break in and rescue said lunch, I had to leave or be late to work, so no use crying over forgotten house keys and soon to be spoiled sushi. At least I have an excuse to munch on all these candies at my desk instead of real food. This packaging and the overall design leaves me feeling really underwhelmed. What's with the random pink spots on the front? Is it supposed to be pink snow or something? They look like a last minute decision to fill empty space, which is really bizarre. Normally Japanese sweets put a lot of effort into their designs and packaging. Is there something I'm missing? 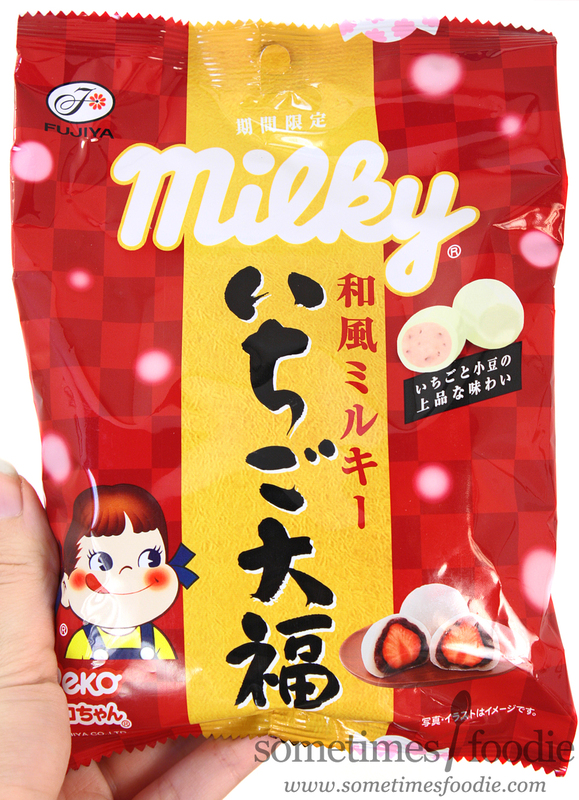 The scroll style design and simple background seem really traditional, but then we have Peko-chan in the corner, a few real daifuku, an example of what the candy inside looks like, and little pink spots scattered about. This design as a whole feels really disjointed. Then again I might be thinking too much about it. It's a bag full of candy! Let's see what's inside. 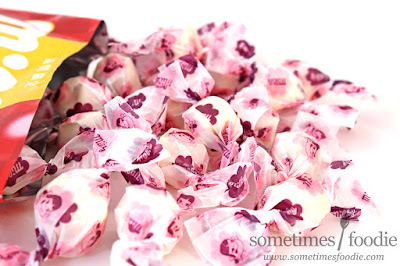 Inside the bag are individually wrapped candies with cute waxed paper wrappers featuring flowers and Peko-chan's face. I actually like these little wrappers a lot more than the bag design. They're much cuter. Okay, moment of truth. 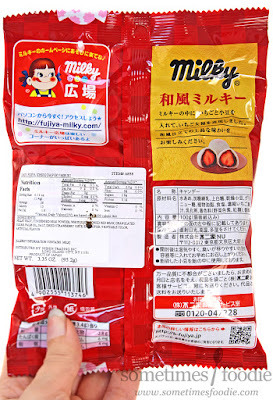 Does the strawberry daifuku-flavoring win over a Milky-hater? The candy is softer than what I'm used to. 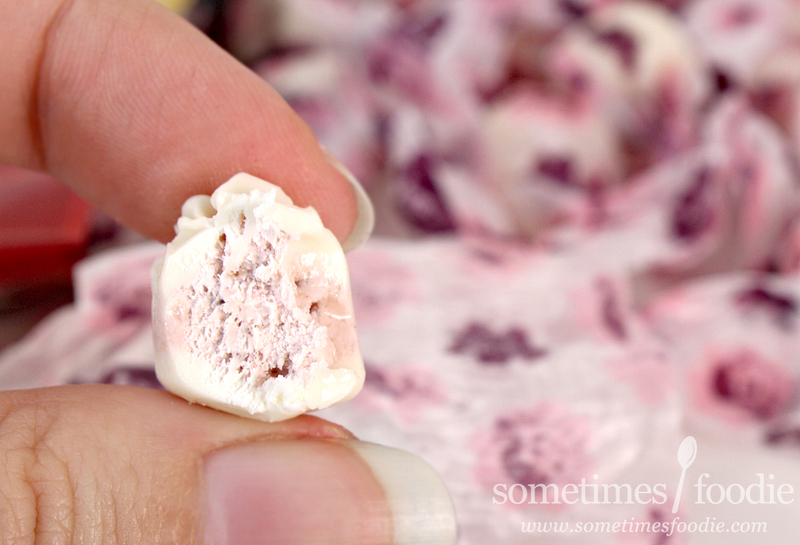 I remember Milky being a harder candy, but I can easily bite these little cream-colored candy nuggets in half. The outside is dense and chewy, similar to stale caramel, while the inside is a little dry and crumbly. Do I like it? Sadly, no. I really really wanted to like these, and I had really high hopes that the strawberry flavoring was going to be crisp and bright, but it's muted and yogurt-y. This is like Milky hard candies and Strawberry Pocky coating were combined into a semi-decent candy. It's okay, and I like it more than normal Milky, but it's not the flavor profile I was hoping for. If the strawberry flavoring was brighter and a little tangier I think these would have been really refreshing, but as-is these are just okay, but the for the record I'm not a big fan of strawberry Pocky. 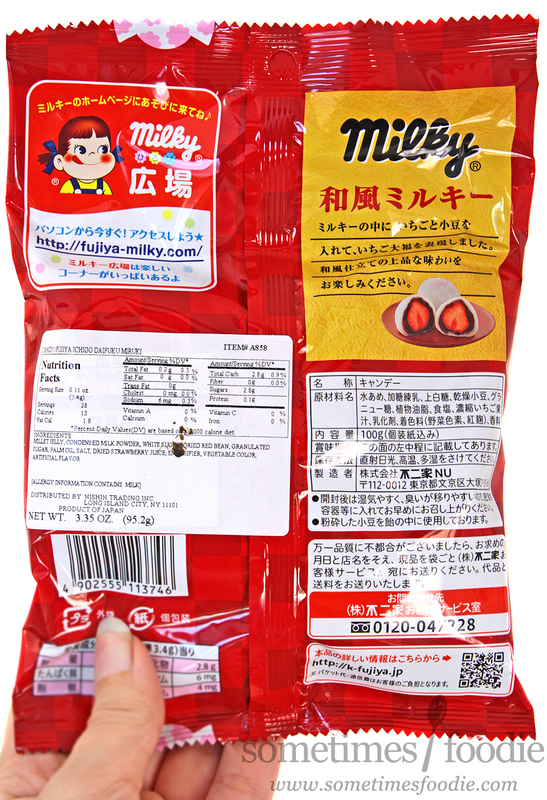 If you are a fan of Japanese strawberry and white chocolate confections, you'll love this stuff. Me? I rather have something a bit brighter and tangier, than something so sweet and yogurt-y.